This past weekend, hundreds of makers from around the community gathered together, taking part in the largest live-streamed startup event in the world. The premise of the challenge was simple: developers had 24 hours to ship a product. From design to development to launch. And so they did. On November 18, over 88 apps were launched, taking over Product Hunt by storm. I was one of these makers. Over the course of these 24 hours, I shipped a product called Opsbot, a DevOps automation tool for indie makers. Here’s what I thought about the challenge. This is a controversial stance, but I found that streaming work through Twitch is very helpful to my concentration. Since I was a child, I’ve struggled with ADD, and focusing on one task without going off on a Wikipedia browsing or YouTube watching tangent has always been hard. But surprisingly, while streaming, I had no issue with slacking off. It’s the most productive and motivated I’ve been in months. Knowing someone is watching you ship and having that constant pressure is quite helpful for my focus. I’ve discovered that trick now. Time to make streaming a habit. Congrats to the launch of https://t.co/4KwvHxMkrS!!!! Throughout the challenge, the maker community was nothing but stellar. It alone made the experience 10x better than any other hackathon I’ve previously attended. Everyone was extremely supportive, and the best example is debugging. Trust me, if it weren’t for a few viewers on my stream, I would’ve never figured out a few bugs while building Opsbot! The input from other makers and viewers in the chat was helpful and kept you awake and motivated. Not only that, but we’d drop by each others streams and say hi. It’s was such a motivating moment to see a maker you know pop up in the chat! This all comes to prove that the maker community is the most supportive community on the Internet, bar none. Without it, this challenge would’ve been radically different. This was an extremely fun challenge to complete. It was stressful at times, sure – sometimes I just crashed in my bed and looked at the ceiling out of debugging frustration and time constraints – but that frustration quickly turns into extreme satisfaction once you’re done with that obstacle or finishing the challenge. Now, just want to cue a moment of applause to the whole #24hrstartup team - Pat, Melanie, and Armin. 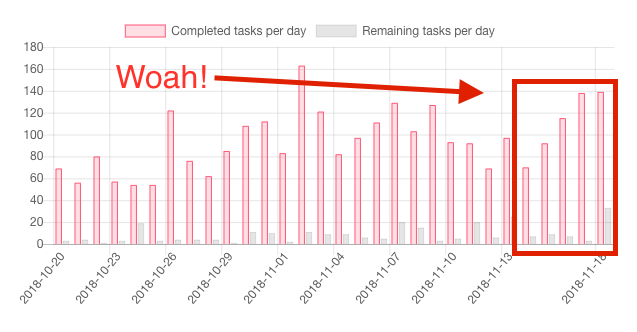 BTW - side note - look at the tasks done on Makerlog chart… that jump during the two days of the challenge! Really tells how you guys united the community. This was an amazing experience - it was better than any hackathon I’ve attended before, and an unforgettable experience with great people. Thanks to all the viewers too - you guys rock!